while your primary gardening projects are on hold. 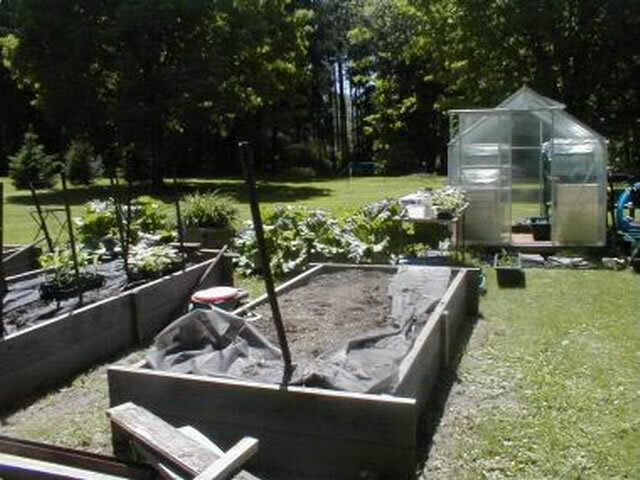 By the time spring arrives, the soil will be settled into place and you'll be ready for planting. 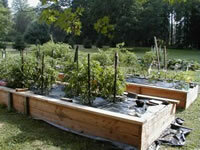 Raised planting beds should be set up in north/south orientation to allow the maximum direct sunlight to both sides. Warning!... the cement in concrete blocks will raise soil pH over time, so soil pH testing should be done periodically. using stakes and string (or a hose) as a guide. Lay a straight 2x4 across the surface you want to check. Fill a glass with water almost to the rim (a glass with a line around it would be perfect). When the glass is set on the 2x4, the distance from the rim to the liquid will be the same on both sides of the glass if the 2x4 is level. Raise or lower the most appropriate end. Remember that any additional compost, manure, leaf mold, or other organic material and at the same time, greatly improve drainage. Now is by far the easiest time to do this! Concrete blocks and bricks should also be set so that the seams don't line up. For strength, steel bars should be driven into the soil through the existing holes in the blocks. The holes can then be filled with cement, soil, or gravel. Building the retaining wall with stones requires the same abilities as to do jigsaw puzzles. The base of the wall should be considerably wider than the top (pyramid style). Interlock the stones together as closely as possible, using small rocks and gravel to fill the voids. 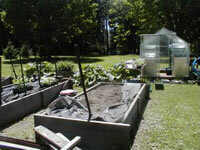 Fill the bed with quality topsoil, allow it to settle for a week or so, and add more soil as needed. Because the soil will continue to settle, you may have to add more soil the following year. to divert excess water away from the pathway around the bed, during rainy weather. the entire bed should be lined with black plastic sheeting before adding the soil.